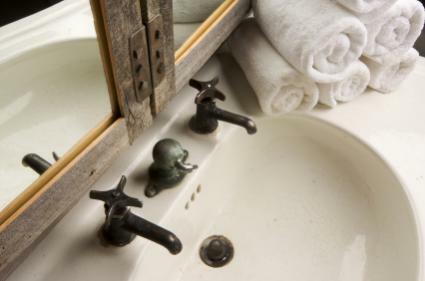 Old style pedestal sink faucets can make your bathroom look vintage even when it's not. Trends in bathroom designs have brought pedestal sinks back into fashion. If you have a pedestal sink that needs an old fashioned faucet or if you want to install a new faucet to make your bathroom appear more vintage, these faucets are available at any price point. There are many different options when it comes to picking a pedestal sink for your bathroom. You should consider the statement that you are looking to create in your bathroom. Faucets are available in chrome, copper, brass, oiled brass, oil rubbed bronze, nickel and bronze. Each of these finishes gives the bathroom a particular look and feel. If you already have water fixtures in the bathroom, you'll of course want to do your best to match the fixtures that are already there. Widespread sink faucets - This type of faucet has a center spigot and two handles on either side that are set apart by at least two to three inches from the spigot. The spigot and the handles are individually mounted. Minispread sink faucets - This sink is similar to the widespread sink in that it has two handles and a center spigot. Instead of the handles being set far apart, they are placed right next to the spigot with the hardware either touching or barely touching. Even though the spigot and handles are close, they are individually mounted. Single post sink faucets - This faucet has the spigot and handle combined. There is one handle to control the hot and the cold water. The handle is moved to the right for cold water and the left for hot water. Wall mounted sink faucets - Wall mounted faucets come out of the wall just above the sink basin. They are very similar to faucets that you'd find in a bath tub. The spigot is separate from the handles and there are usually two handles (one for hot water and one for cold water). Bridge sink faucets - Bridge sink faucets are very unique looking. They come out of the top of the sink from two different places, the right and the left side. There is a bar connecting those sides and the spigot comes out of the top of that bar. Basin tap sink faucets - With basin tap sink faucets, the handles function as individual spigots. The hot spigot and the cold spigot can be used together to make the water warm in the basin. Centerset sink faucets - Center set sink faucets are very similar in appearance to minispread faucets. However in the case of center set sink faucets, the spigot and the handles are connected by hardware underneath. Fortunately, since pedestal style sinks are so popular these days, there are a variety of different places online where you can purchase the faucet that will match your décor. If you can't find a faucet that suits your tastes in your local area at a hardware store or home improvement store, you can take a look at the following specialty bathroom supply stores. Historic House Parts - This site sells sinks in their entirety but also offers faucets on their own. All the pieces are actual vintage parts so they are sold as is. You'll need to carefully consider the dimensions of your current sink because oftentimes older parts come in a smaller scale. Vintage Tub - This store offers free shipping to the United States and Canada. It has vintage reproductions of all types and offers many different styles of vintage sink faucets. With these resources, you'll be sure to find the faucet that will fit your bathroom.